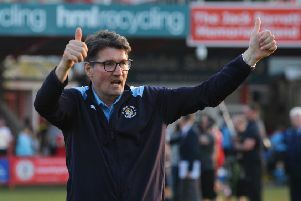 Luton boss Mick Harford won’t be entertaining any talk of Championship football until if and when his side actually get there this term. With 12 games to go, the Hatters are top of League One and five points clear of nearest rivals Barnsley. Everyone has got one goal, hopefully we can get there, but until we get there, we won’t speak about anything like that. The second tier of English football is now flooded by clubs who have come down from the Premier League in recent years, the likes Stoke City and Aston Villa to name just two. When asked if Luton could cope playing at such a level next season, Harford said: “I don’t really want to talk about it all fairness, as we’re not even there yet. If and when we get there then I’ll happily speak about it, but all I can say is we’ll keep trying, we’ll keep doing the best we can to get ourselves in a good position. Harford, whose role at Kenilworth Road prior to replacing Nathan Jones until the summer was head of recruitment, did admit they are having to plan for life in both the second and third divisions of English football. He added: “We are still looking at players, looking to recruit players for the summer, albeit we don’t know what league we’re going to be in, but we have to have contingency plans. “We have a scouting system, I wouldn’t say it’s a major one but we have scouts dotted around the country who will be out working most evenings, Saturday afternoons. “I’m still telling them where to go and what to do, they’re doing a great job and working very hard for the football club. “We concentrate on getting as many wins as we can this season, but we have to have our finger on the pulse in terms of players.